See Barbara's latest ebook below – a contemporary romance. All of Barbara’s eBooks cost just $2.99 US! Did you know that you don't need an eReader to download eBooks? You can either read it online or download it onto any PC (most convenient when located onto your Desktop). 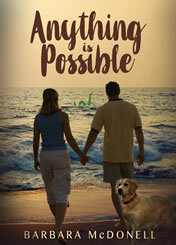 For reader help, click the "Support" link on my book page. DIY unclutter-and-organize secrets from a pro - giggles guaranteed! Would you like to eliminate clutter but feel stumped as to how or where to start? Is money tight? "The Clutter Queen Spills!" is your affordable solution, letting you take on an uncluttering project all by yourself! This 133-page self-help guide was written specifically for busy women and their organizing issues. 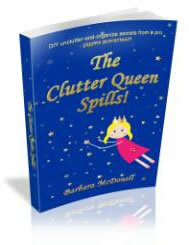 Featured on radio and TV, Clutter Queen Barbara shares her decade of professional organizing knowledge and experience to help readers accomplish uncluttering missions easily with a wave of her magic wand. Investigative reporter Luc Gagnon wants a blockbuster national story. He doesn’t believe in woo-woo stuff, so when his boss assigns him to check an alleged sea monster sighting, he’s not happy. Despite Daria McKenzie’s attraction to Luc, a reporter at her door is her worst nightmare, reminiscent of the tragic media circus her family experienced a decade earlier. To prevent a nasty repeat, she denies her sighting. Luc suspects her evasiveness means she’s hiding a bigger story. Could her secret be his big break? If Daria reveals her secret it will give Luc a huge news story and destroy her family all over again. Will she risk trusting the man she’s falling in love with? Will Luc choose an award-winning headline over love? Life is suddenly changing for nine-year-old Zoe and Ben. The O’Reilly twins are moving from their house in the country to a city home in a neighborhood they know nothing about. Saying goodbye to friends and leaving familiar surroundings is tough and they don’t want to go. There are no woods near their new house and no kids on the new street either. Zoe and Ben are also worried about their cat, Purrsnikitty, who is famous for chasing cows and herding sheep. How will he adjust to city life? Soon, Purrsnikitty begins to disappear. He returns home every day with weird gifts, like a map and an eagle feather. Where is Purrsnikitty getting his loot? Why is he dragging it home? Has their oddball country kitty turned into a city bandit cat? 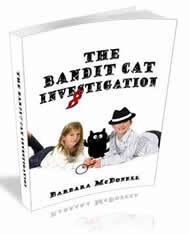 Determined to solve the bandit cat mystery, Zoe and Ben investigate. When Purrsnikitty gives a huge yellow maple leaf to a stranger, it triggers an exciting chain of events. In the process, the twins meet new neighbors, make new friends and learn that life in the city can be just as much fun as life in the country.